Before I came inside for the day, I ventured out with the camera to capture a few glimpses through the garden gate. Summer's well on its way here: it was feeling a mite warm out there this afternoon. The morning was pleasantly cool, though, and the air was a bit drier than it has been. I savored it all the more knowing that it won't last long. You'll notice that you can see the path again: the plants that were flattened by the downpours last Monday and Tuesday have sprung back up. You might also notice, if you enlarge the pictures, that I did some whacking back and pulling of the spiderworts. I've also been pulling spent poppies, toadflax and larkspur almost daily. My kitchen table has baskets and boxes and bags scattered at one end because spent plants = seeds for next year! The vitex which was in such low spirits last week has recovered fairly well. I'm doing a little careful pruning here and there to lighten the load on its limbs ... I'm not doing too much because it's getting ready to bloom. I stood at the gate and took this shot looking through the Italian Flat Leaf Parsley. Its blooms have been quite popular with lovebugs. 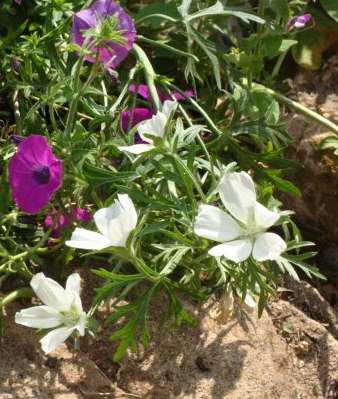 If I stand at the gate and use the zoom on the camera, I can get a shot of this white Phlox pilosa on the other side of John Smithley rock bed. Gail of Clay and Limestone raves about her Practically Perfect Pink Phlox: it's one of her signature spring plants and deservedly so. I found this white-blooming variety at a local nursery and it has certainly been a stellar performer in its first year. Gail will be happy to hear that I've also got a small plant of PPPP coming along at the front of this bed. I'm hoping to rave about her in tandem with Gail this time next year! The tangled tresses of Mexican Feather Grass make a good backdrop for the Laura Bush petunias. The white blooming form of our native Texas Callirhoe reseeds for me much more readily than the wine-colored one does. Anjelica caninus, commonly known as Annie, enjoys sunning herself on the path. * I visited Zone 9 Tropicals (zone9tropicals.com) at the urging of Houston Chronicle garden blogger Randy of Jungle Heights. I don't grow a lot of tropicals, but this nursery could convince me to do so! I came home with a Red Iochroma, Red Plumbago and Compact Purple Cestrum. Do NOT ask where I'm going to put them. I'll do what Randy says he does when he buys a new plant and brings it home: stand in the middle of the garden with plant in hand, turning round and round and saying to yourself "Now WHERE can I put this?" (I wonder if wearing a pair of emerald slippers and clicking our heels three times while repeating that mantra, would make it easier to find a spot for the plant?) Randy deserves a big shout out for his gracious response to my suggestion that he host a meeting of the Chronicle bloggers. Our visit to his delightful home and garden on Saturday was all that we could have hoped. What he's done on an urban lot is truly amazing and a HECK of a lot of fun! I'll leave y'all with a shot of the leafy green jungle lurking behind his bungalow. Hey, Cindy, where are you going to plant your new tropical plants, and those other new plants you are hiding in the holding area? The garden looks so full and lush. I'm sure you'll find someplace with a little spot of bare earth! Are you planning a tropical "room" or will you intermingle? It's looking quite lush through that garden gate! Welcome to the Phlox pilosa appreciation society. They are such great plants. And that canine is awfully cute. absolutely gorgeous! Ladybird would be so proud. Cindy, I love how your Mexican Feather grass is such an effective background plant. It's one of my favorites. My parsley is also going to seed. I was going to rip it out til I saw the indigo buntings eating the seeds! I have a question for you about your spiderwort - do you save their seeds too? I have it coming up here and there and really need to do some editing of it. But if I could just save some seed then I could pull it up with abandon! absolutely gorgeous! love these pics!